This week, we want to remind everyone about our upcoming World Wide Knit in Public Day as well as talk a bit about spinning. Let’s chat, shall we? Hang out with The Ewe Crew for our Annual World Wide Knit in Public Day Celebration on Saturday, June 9. We are hosting our fifth World Wide Knit in Public Day event (the third at this location). We welcome all fiber artists and makers to come and be with other makers. Come rain or shine, we will swing open our industrial doors and make room for fiber, friends, and nature (not necessarily in that order). There will be a new color way for sale as well a raffles and giveaways, and light refreshments. Visitors who plan to stay awhile should bring a knit/crochet/drop spindle project, sunscreen, a brown bag lunch, a folding chair, a reusable water bottle (or buy one from us) to use our water fountain, and perhaps even a beach umbrella if you want to sit outside on the (very safe) grassy knoll. While we usually focus on knitting and crochet (since that comprises the majority of our followers), we love to support other fiber arts as well. We’re going to miss our Spinning Saturdays, which we put on hiatus through the hot summer months so we will give spinning our attention here in this climate-controlled Etherverse. There are unique spinning terms just as there are with any of the fiber arts. Some of them are a bit more fun than others. For instance, “spinning a yarn” means something quite different to fiber artists than it does to the non-making community. So do the terms “getting carded” and “putting a crimp” in someone’s style and “top knot.” This makes us think of other pseudo fiber-related phrases like “getting my weave on” and “yanking my chain” too. Ha! The Fibre Studio is most known for our Fifty Shades of Gradient™ line of products including yarn, roving/top, and our deja vu sock yarn. However, spinners can create gradient yarns at the wheel (or slightly before) in a couple of different ways. Spinners can organize their braided hanks in a couple of different ways to create gradients. Firstly, makers should take a variegated hank of roving and separate it by color…from light to dark or even into a rainbow effect. A very helpful video can be found here. Secondly, spinners can also ply chain spun fibers to blend those yarns into true ombre effects, marling the fiber when necessary to get a good blend. Spinners have stashes and leftovers too. If s/he wants to stash bust in order to spin ombre yarns, carding a variety of colors (or fiber types) together into color-concentrated bundles is a great way to create a gradient effect. A helpful video is found here. When creating a gradient effect, the maker should just vary the color concentration from light to dark as it is carded. Bag and organize those resulting bundles and then spin the bundles in the appropriate order to get the desired effect. Spinners may already have top ready to be spun. There is a simple “formula” to use to create a nice gradient effect. For instance, if the maker has two, 6- or 8-oz hanks of roving, s/he can organize the top into smaller bundles and then spin and ply into gradient yumminess. Want to know what we’re deweing? Pop in to see our studio wörks on Ravelry, Facebook (we post changes to our business hours here), and Instagram as well as on our website at thefibrestudio.com (we post changes to our business hours here). Join us on Saturday, April 12 for a fun wet-felting workshop with Vickie Clontz to create this beautiful ruffled scarf of hand-dyed merino wool fibers, silk, bamboo, and other exotic embellishments. This will be a full day workshop 10:30a-5:00p and is ideal for both beginners and more advanced felters, students will complete a scarf in their own personal palette of colors under Vickie’s experienced instruction. Workshop fee is $95.00 and includes all materials and classroom fees. Wear comfortable clothes and bring a beach towel. Call The Fibre Studio to reserve your spot. I received these lovely hand dyed fibers today from Gerschubie Fiber Arts. The fiber is 100% Punta Wool, great for spinning and felting. Students will design their scarf and then give it shape using the “wet felting” method. 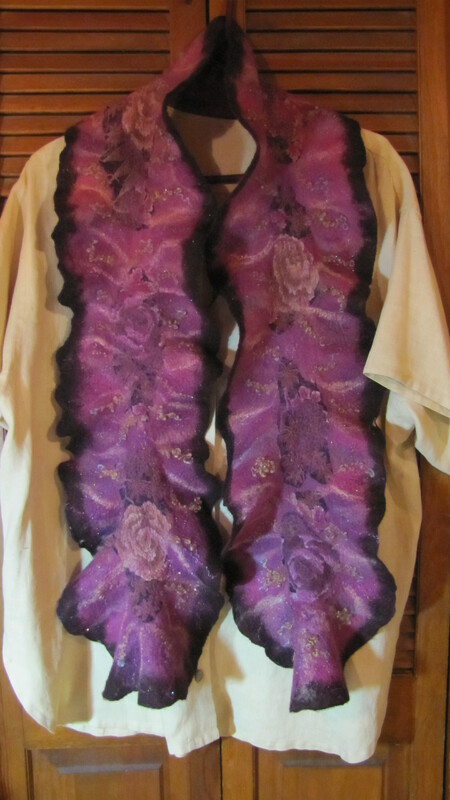 These scarves can be molded, cut, and decorated to the student’s personal taste. Wet felting is physical and fun, and the class is truly a hands-on good time. Karen Simpson lives in Independence, VA which is on top of a mountain in southwest Virginia. She is an instructor at The Chestnut Creek School of the Arts–teaching classes in fiber arts, wearable art, sewing, and costume design. 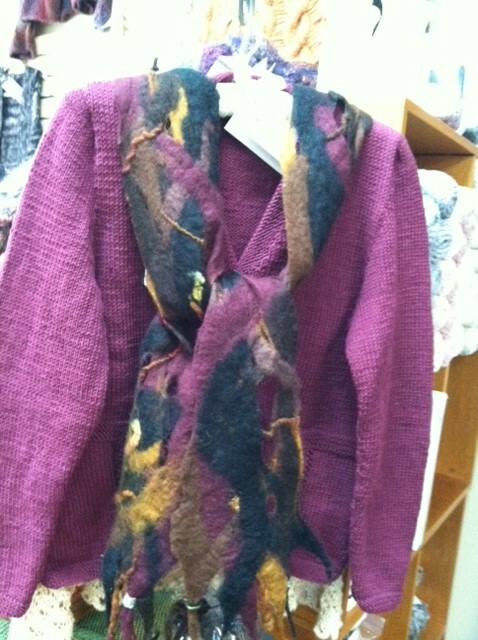 She is also an instructor at Peaceful Hearts Alpaca Farm and often travels to lead workshops by request and by design. Karen is a member of: The Southern Highlands Craft Guild, The Board of The Arts & Cultural Council of the Twin Counties, The Grayson Artisans Studio Tour, The Grayson County Fiber Guild, and ‘Round The Mountain. Cost: $60.00, all materials included. Wow, what a great Sunday to be open! We had a couple of young ladies who were new knitters sitting with us, Dr. John Hall teaching a Spinning With a Drop Spindle class…and then there was Elvis. We had five students in our spinning class, which was taught by Dr. John Hall. The ladies learned how to spin using a drop spindle. After a brief description of how fibers (we used Manos 100% merino roving) twist together and then walked through the anatomy of a spindle, the students were quickly spinning away. This was very much a hands-on class. Dr. John did a great job of launching the students’ first homespun skeins of yarn. If the class wasn’t fun enough, one of the students–Debbie McCormick of Heart Felt Hares–introduced us to Elvis, a five-pound fuzzy bundle of love. Accompanying Elvis were three 9-week old bunnies; we’ll call them The Lovettes. Nice ring, right? Elvis and The Lovettes. Within moments, Elvis and The Lovettes were getting a big Viva La Fibre Studio welcome by both adults and children alike. [Note: These angora rabbits appear huge, but they are light as a feather…just fuzz bunnies, literally.] Debbie McCormick eventually made a place for Elvis on her lap and actually spun angora straight from the bunny onto her spindle. What a hoot! Ya never know what’s gonna happen, or who’s gonna show up, at The Fibre Studio. Well, it’s now 6pm. Elvis has left the building.